A rummage through random aspects of the past that interest me and may be of use or interest to other readers and writers of period fiction. Please note that the stories featured and my artwork for the covers are copyright; and have the courtesy to ask permission if you wish to use anything that is mine, and duly acknowledge it if you do. Introducing Adrian Howlett, local historian. We've all read about our favourite heroines in Bath, even in Tunbridge Wells and other spa towns. But why have they never taken advantage of the natural springs of Ipswich? Adrian has the answer to why it never took off. Whilst researching the history of Holywells Park references were stumbled upon to mineral springs with healing properties and the missed opportunity for Ipswich to become a Spa Town as famous as Bath, Cheltenham or Tunbridge Wells. The Cobbold brewing family created the myth that their springs had healing properties as they used to supply part of the town water supplies and used the water from beer, but as part of my dissertation the water was tested at Suffolk College by the Atomic Absorption spectrometer and found to have pH 7.35, lots of Sulphates of Calcium and Magnesium, undetectable iron, and nitrates at 87ppm (drinkable limit 50ppm) which meant that Holywells Water is bog standard shallow spring water. However, there may have been reports of springs in Ipswich that were more iron rich and thus could have some tonic effect. These iron rich mineral waters are termed Chalybeate. Sulphurous smells detected in some of the water may have a mild antiseptic effect. (Water from Woolpit Lady Well was analysed by Clive Paine and found to be rich in sulphur that could explain the historical reputation for healing eye complaints). 2) H Seekamp writes that Issac Brook, Cooper, discovered a sunken, brick arched spring in St Georges Lane that he supposed was mineral water as it had such a foul taste. Three Doctors (including famous Dr Coyte) had the water analysed and found it to be equal to the waters of Bath – Medcalfe Russell of The Chantry had been recommended by his London doctor to go to Bath to take the waters took this water instead and was cured! The water from this well was sent to London for Analysis by Mr Barry who stated that the water contained, Iron Sulphate, Iron Carbonate, Sulphurated Hydrogen (from degrading pyrites) and he saw no reason why this water and Ipswich spring waters with different properties could not be rendered serviceable and bought into general use. 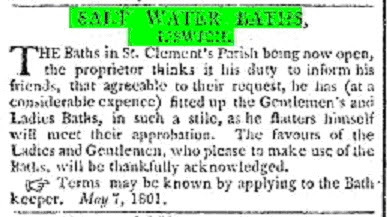 A puff for 'Ipswich Spaw Water' appeared in the Ipswich Journal May 20th-27th 1721. (Puff is a term used for inflated claims for Spa water efficacy) As the address was St Margarets Green, the source was probably one of the Christchurch springs. Experimentally found to be good in the gravel of the kidneys, obstructions in the liver, spleen &c. Hectic fevers, the scurvy, violent vomiting, lost appetite, the jaundice, King’s-Evil, salt and hot humours in blood, pains in stomach, frequent spitting of blood, or bleeding at the nose, diarrhoea or blood fluxes. Sold at two pence per flask or quart, or each time of drinking what you will in the morning. By me, JONATHAN ELMER, living on St Margaret’s Green, Ipswich. It held society events such as the Ipswich Races in the first week of July, which was attended by the nobility. Associated with race week were Balls and the start of the Ipswich Theatre season. Fountain Tea Rooms & Gardens on the banks of the Orwell near the Cliff Brewery was probably a Pleasure Ground and notable attraction, but more research needs to be done. St Peters parish opposite St Mary Quay church. (c,1830) Run by Mr Shaw who provided Vapour and medicated baths, hot air fumigating baths, salt and freshwater baths plus hot and cold showers. He was seemingly linking his operation to the taking of mineral waters though as Clarke (1830) makes this suggestion. By the 1830’s it was too late as building encroachment had stopped access to the viewing point from Stoke Hills - imaginatively once compared to the Lake District by a local poet. Factories such as ransomes employed masses of workers from the country and the building boom quickly led to gobbling up the green spaces to be replace them with rows of back-to-back housing with it’s associated overcrowding, disease, dirt and pollution. Ipswich Town, Spa town was a great opportunity missed. Lisa, can you email me on sjwaldock@yahoo.co.uk? Adrian is a very private person but if you talk to me, I'll talk to him and I can ask him to talk to you, if that makes sense. YAY! I am on Amazon.co,uk with books! Well, let me see, I'm a bibliophile, Ailurophile, technophobe and practising to be a grumpy old woman. I get irritated by glaring anachronisms in fiction, and I love to read a well researched book. I live in East Anglia in England, and I love the history that surrounds me there. My major field of interest is in textiles; I also sew.